On Sunday evening I took a brief hiatus from my Boothbay cardigan collar (seriously, the 5 inches of garter stitch might kill me) and started on a smaller sweater for my girlfriend’s daughter. This is my Sorority Sweater. Here’s the backstory. I don’t have any children of my own but I have two amazing godsons who I adore. This year one of my closest girlfriends who is like a little sister to me had a baby girl, Maddie. Of course, I have gone overboard with making her little girl things because little girl things are the cutest things ever. My girlfriend is in the sorority Delta Sigma Theta and at homecoming she and her sorors will get together wearing their Greek letter jackets and sweaters and they will have their children in tow. So of course, I had to make Maddie a sweater to match her Mommy. How could I resist a cuteness challenge? Plus it will make all of our friends just melt from the cuteness when they see her in it. 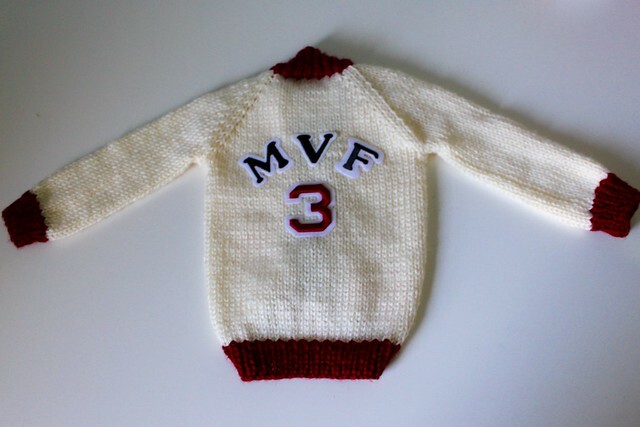 Her initials are MVF and her mom was number 3 on her line and Maddie made them a family of 3, so I had to add a 3 on the back like her mom’s jacket. 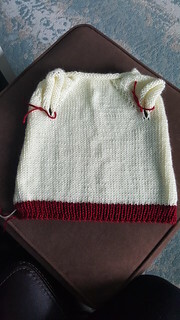 The sorority colors are red and white and I went with a light off white and a deep red of the Caron’s Simply Soft for this project. I know a lot of people are anti acrylic yarn but when it comes to making items for babies/kids I have to go with what is machine washable and dryer friendly and this yarn handles the wear and tear. I also use Simplicity applique letters and use fabric fusion glue. After 24 hours it should hold up and can even handle the washer and dryer. 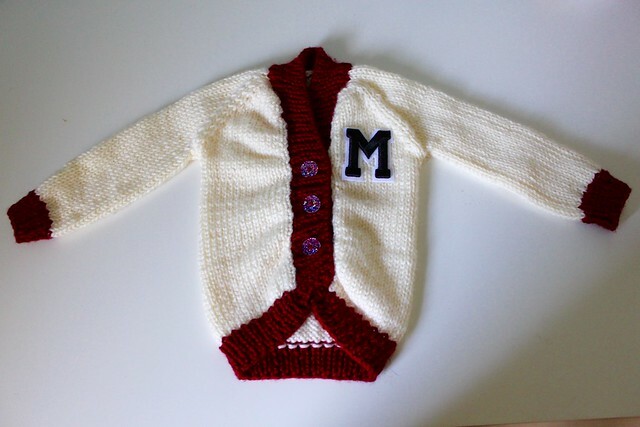 I combined a lot of techniques from a couple of patterns and my notes of making a million baby cardigans to come up with this one but the sizing should work for 6-12 months and Maddie is currently 8 months old. I have to admit, out of all of my knitting these are my favorite kinds of projects. They’re fun, made for such cute little people and take the least amount of time. Maddie already has a lovely coat for fall that she finally fits and will have a wardrobe of hats to follow. 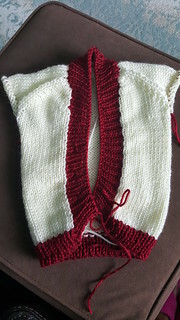 Now back to finishing up Boothbay and I’m hoping to get an Oatmeal Pullover completed before next Friday. I’m flying to Chicago for a girl’s trip with my mom to visit my cousin and I’d love to take her a new sweater! What have you finished up lately? Are you catching the fall knitting bug yet? Previous Post Previous post:Where Do You Knit? Next Post Stitching Status: So. Many. Stitches! I rewarded myself from finishing the garter stitch collar on Boothbay and started Oatmeal…I’ve already separated for sleeves. It’s super quick! That sweater is the cutest!! !